I was born in Burma and moved to the USA in 2002. I am single and live alone. I don't have any children or pets. I work for a Property Management Company and I speak 3 languages- Burmese, Mandarin Chinese and English. I started hiking during the Winter of 2016, here in the Las Vegas area, with Las Vegas Dauntless Hikers, Vegas Hikers and Dirty Rotten Hikers where I discovered how much fun scrambling and hiking is. 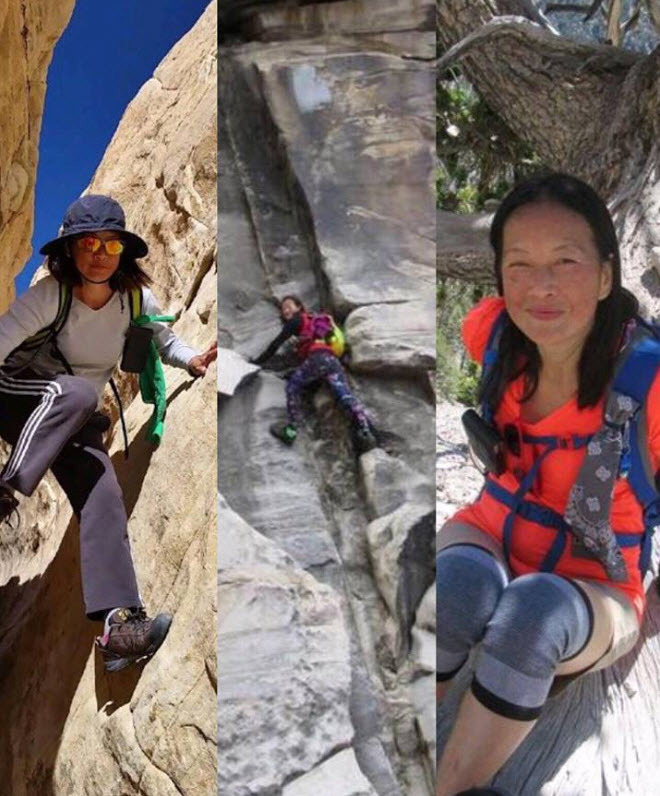 My "big sister", Lana, encouraged me to join Hiking Las Vegas / 52 Peak Club, and I decided I wanted to try it and be a 53er like her, and some of the other hiking friends like Erika Aloha and Rob Robinson, who are also 53ers in the 52 Peak Club. I love doing activities outdoors and going out with my girlfriends to go shopping and eat at different international restaurants. I have made so many great friends since I started hiking and I know some of them will be my friends for life. I've always been happy with my hiking group and the 52 Peak Club always feels like my real family. I look forward to my weekends to go on hikes with my "Family" and it is always a happy time for me. The best thing about being a member of Hiking Las Vegas / 52 Peak Club is that they are always teaching you how to do new skills, being there for you to be SURE you are always safe and doing things safely. They always look after each other and support everyone to get us to the top of the mountain and back down in the safest way possible. I've learned so much from the Organizers and other hiking members about scrambling, rappelling, hiking safety, outdoors skills, having the right type of shoes, backpack, enough water and extra supplies when we are out in the wilderness areas of the desert and mountains,..... And it helps all of us grow and develop more confidence in ourselves, as well as helping us to get healthier, more physically fit and tougher. My Big Sister, Lana LeSoleau; and friends Erika Aloha & Rob Robinson, convinced me that I should join the 52 Peak Club and start hiking with the "Big Kids" and getting cards for climbing the BEST 52 best peaks in the Las Vegas Region, to eventually become one of the elite 53ers and hold that very coveted status that less than 160 people have ever achieved out of thousands who have attempted it! Hiking Las Vegas / 52 Peak Club is the BEST Hiking/Scrambling/Climbing club in North America and has the best members and best leaders, too! I have always enjoyed the special themed events, and 53er Celebrations that 52 Peak Club has had, and it is some of the most fun I have had in years! Date Completed all 52 Peaks: Mt Charleston June 23rd, 2018, with Ernesto Chavez as the Assistant Organizer leading. Toughest Peak: Holiday Peak, because of the 2 long nearly vertical rope climbs on the way up. I feel excited to have accomplished this personal goal of becoming a 53er. It is probably the biggest goal I have ever chosen to do and it has been extremely challenging. I have had to work hard to become and stay fit enough to even climb to all of these summits and earn each one of those precious 52 Peak Club Cards. I have a sense of self-satisfaction that I did this that is better than any other thing I have ever accomplished. 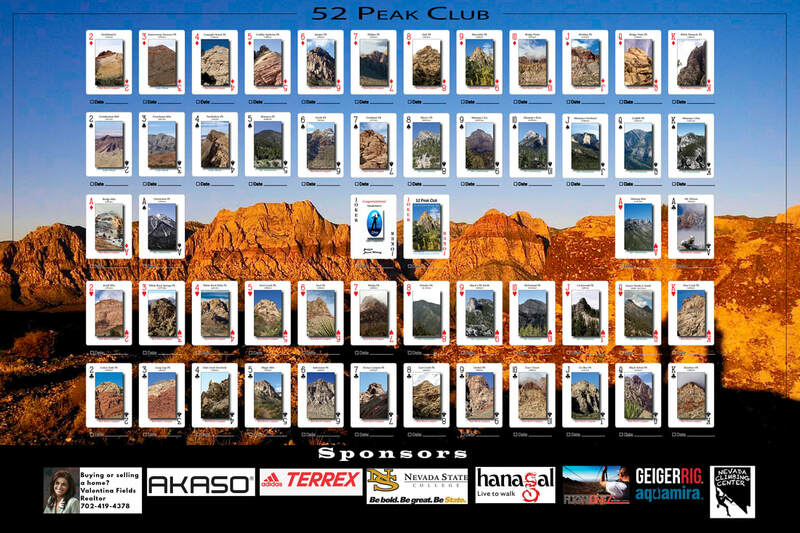 I want to thank the Hiking Las Vegas / 52 Peak Club Organizers / Leaders for all of the help and backup they gave me that made it possible for me to become a 53er. I especially want to thank Branch Whitney, Kathy Kelbel, Rob Shaw, Anneliese Hall, James Fuentes, Ernesto Chavez, Ted Williams, Dinorah Arambula, Carl "Oz" Ramzy, and Ash Ash. It is really important to have the right type of shoes when we are hiking in Red Rock Canyon Nat'l Recreation Area, because without shoes like 5-10s or Adidas that have Stealth Rubber, you will be slipping all over the rocks and won't be as safe as you could be otherwise. It is always important to carry plenty of water for the hikes, and the hotter it is, the more important it is to have lots of water. Never carry less than 2 liters and preferably carry it in a comfortable hiking day-pack with a hydration bladder instead of individual bottles. Have Electrolytes, some energy bars, sun glasses, sun screen, and sun screen lip balm, and some simple first-aid supplies and a small flashlight in case you get caught out later than you planned. Having a map of the area you are hiking in is also a good idea. Get a good night's sleep the night before a planned hike and drink plenty of water the day before, and don't miss having some food before you start hiking!